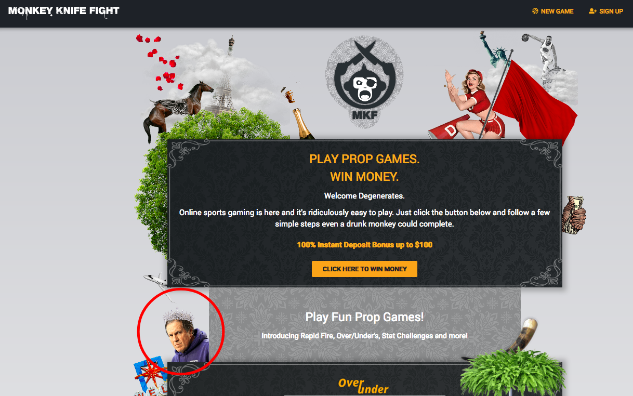 Almost as if it popped up out of nowhere – check that, popped up out of The Simpsons – Monkey Knife Fight is a new online DFS prop platform. 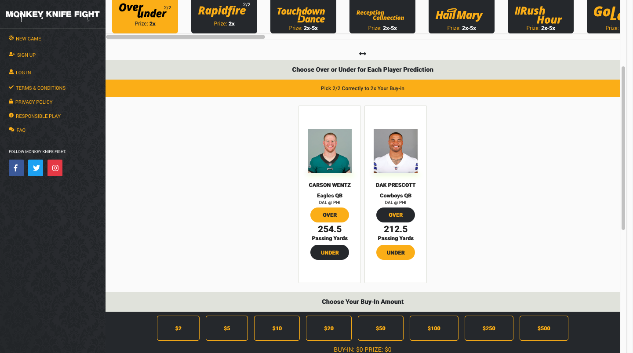 Ever since the SCOTUS struck down PASPA – a decision that made sports betting legal in the US – daily fantasy sports (DFS) players have wondered whether they’d see DFS-sports prop hybrid games or platforms. Monkey Knife Fight is the answer to that question, and it appears to be the first of its kind. And now, back to our regularly scheduled program, which is a full Monkey Knife Fight Review. Other than being part of an iconic Homer Simpson quote in which he jabs at anybody not living a hedonistic lifestyle (aka, not playing on monkey knife fights), the Monkey Knife Fight platform is like the brand new toy of the DFS market. Monkey Knife Fight wants sports fans and bettors to let go of their inhibitions, choose a game they’re going to sit down and sweat, and make some fun fantasy picks. No more, no less. Once a game begins, all the entries in the same prop contests are matched up, at which point it’s time to sit back and watch the carnage…err, I mean the game! Bill Belichick in a tiara? Sign me up. A mobile app is on its way, however the mobile web version will also let players enjoy the same games from their phones or tablets right now, making Monkey Knife Fight an easy-to-play game from anywhere. After you create a monkey knife fight account, entering contests is as simple as making a few clicks. It’s probable there will be a seamless mobile app in the near future, especially since Monkey Knife Fight is specifically geared toward fans watching each individual game. But for now, the web experience is a good one. There are no slow pages or errors, and entering a few props literally takes 30 seconds. Monkey Knife Fight has a wide variety of game formats, and any fan looking for a sweat will certainly find an option to support their opinion of a certain game, team or player. Boom, you’re in a Monkey Knife Fight contest, and can double your selected wager if your two picks come in. It’s as simple as Carson Wentz chucking it for over 254.4 yards and Dak Prescott falling short of 212.5 passing yards. Easy game! 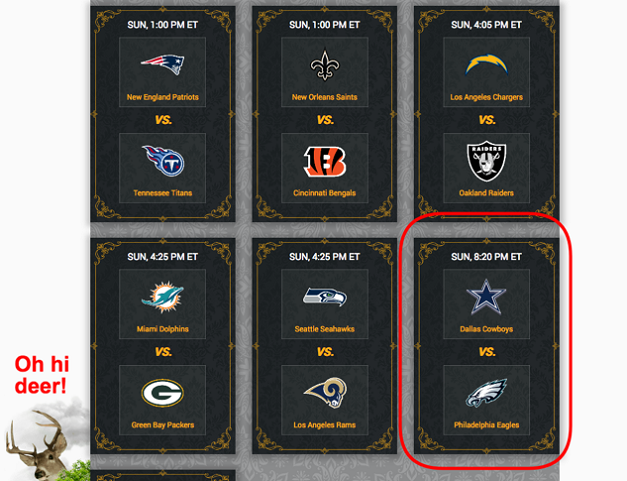 Over/Under – As seen in the above screenshot, these games involve picking “over” or “under” for each of the players and predicted lines. Win 2x your buy-in for choose correctly! Rapid Fire – These games ask players to select the highest scoring players for a series of head-to-head player matchups. Win 2x your buy-in for getting all the matchups correct! Stat Shootout – Available for various stats, these shootouts ask players to choose the players from a list who they believe will accumulate the most of the chosen stat type. 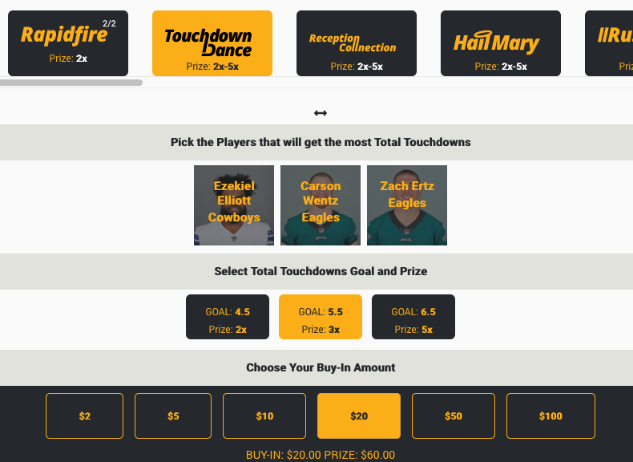 For example, in the “Touchdown Dance” stat shootout game, a player could select Ezekiel Elliott, Carson Wentz and Zach Ertz to score OVER 5.5 touchdowns, and earn 3x their money. Win anywhere from 2x-5x your money when you nail your picks! Monkey Knife Fight DFS prop games are currently available for NFL, NBA, NHL and LOL. Monkey Knife Fight has live chat support available directly on its website, or you can contact support via Twitter, Facebook or Instagram. Monkey Knife Fight accepts deposits via credit and/or debit cards. Withdrawals, which are always processed directly back to the original deposit method first, can be made via PayPal or check for additional winnings. Can I Play On Monkey Knife Fight? In order to be eligible for a monkey knife fight, users must be 18+ years of age, and a resident of one of the following states: AK, AR, CA, CO, CT, DC, FL, IL, KS, KY, MA, MD, MI, MN, NE, NH, NM, NC, ND, OH, OK, OR, RI, SC, SD, UT, VT, WV, WI, and WY. Monkey Knife Fight is fun. In the end, you’re just picking props, but the site, and the tone of the company’s social media profiles, is pretty awesome. Give them a follow on Twitter if you haven’t already, it’s so worth it. You don’t be disappointed if you give Monkey Knife Fight a shot, and you may even win a few bucks while watching your favourite team or player. There are much worse, and less fun and engaging, ways to enjoy sports props. Monkey Knife Fight gets a full and hearty RotoGrinders recommendation. Enter the Monkey Knife Fight promo code ‘GRINDERS’ using his link, and get a 100% match bonus up to $50! Get more details on how to get this offer with our Monkey Knife Fight promo code here.